Getting a Korean driver’s license was thoroughly liberating and allowed me and my wife to see parts of South Korea that would be nearly impossible without a car. You want one too, right? First, I’ll let you know about how you can pass the Korean driver’s license test from scratch! Afterward, you can read my story about a wonderful yet nerve-wracking day at the Korean DMV. I recommend you arrive as early as possible. The whole process will almost take an entire day even though I arrived at 8:45 in the morning. Be prepared for limited English ability. There was one lady who spoke English and she basically guided me through the whole thing. Bring about 100,000 won in cash. You won’t spend all of this but will spend about 75 in scattered fees and will then want to eat some lunch, which there may or may not be a restaurant on the premises. Bring passport photos. Up to 5 will be needed throughout the day, for reasons they don’t really explain. First, you go to a “safety” class where you watch a video for an hour. It’s all in Korean but if you pay attention to it, some answers to the written test lie within. I’ve heard that there are subtitles available but for me, nobody thought to switch them on. Next, you have to register and do a “physical test” where they check your eyes. Then there’s the written test, which is on a computer. 40 questions in English. I didn’t really study for it other than following things that were on the safety video. A coworker told me before going that I should always give the “nice driver” answer. If you really need to study, have a Korean or Expat friend find them online. They are readily available and not too difficult to find. Next, you have to do the “on course” drivers test which is simple. Just show up early and watch the videos telling you everything to do. That one is easy and really hard to fail. You do things like switching on turn signals and windshield wipers. After that, you’ve got the main event. The driving test where you follow a GPS for 5 km with an instructor and partner, who’ll either let you drive first or elect to go first. After the test, you get the “okay” on whether or not you passed and then back into the office, where you wait for them to print out your license. Get your license and get out! Buses or taxis should be waiting nearby, as they were for me in Naju, near Gwangju. My nerves were shot, especially with another night in this terrible mosquito-filled hotel on the line. I sipped on some cold-brew coffee and started getting ready while the day’s final World Cup match played on the TV. A few moments later and I was outside, scanning the streets for a taxi. This was the first clue that my day would be a long one. The trip to this small city near Korea’s southwestern edge had already cost me a day of my otherwise relaxing vacation but honestly, I needed some action. No desires to travel at the moment thanks to a big trip coming in the late summer. Lazy days and scooter rides to the beach filled my time thus far so what ELSE was I going to do? I’d wanted a car for a while and driving in Korea required first getting a license. My American one had expired so a simple trade-out wasn’t possible. There’d be a series of tests and time wouldn’t be on my side that day. The taxi pulled up to the office in this not quaint yet inconvenient-to-reach town. Naju is a small city whose massive pears make New Year’s gifts throughout the country. Getting to this tiny town requires either the fortune of living in Seoul (direct buses) or Busan, or traveling to and transferring through nearby Gwangju. Falling into the latter, I had the pleasure of spending a vacation day visiting this jewel of a small town. The added pleasure of missing my stop made the journey seem even more hopeless, thanks to a rookie assumption that Naju’s bus terminal would be the final stop. After walking through the doors of the regional driving office, I was happy to see some of the signs posted in English. I can read and know some words but my Korean ability is more properly suited for situations involving small talk, taxi rides, and restaurants. Also as with other people, alcohol helps. Worst-case scenarios involve times when serious and sober questions are posed with definite answers required. I took a ticket and when my number came up, the lady at the counter’s eyes ballooned at the sight of me. I knew what was up. She was scrambling to find someone and thankfully, there was ONE employee in the building with a strong-enough command to help me through the entire process. The people at the office were extremely nice and I owe a huge debt to them for making the day better than it could’ve gone. As the first series of hoops appeared, my determination kicked in. Coffee had done its job. The first step was the most important and the main reason that I had to arrive so early. An hour-long safety training course was an unavoidable obstacle and since I couldn’t find any preparation materials online, maybe attending was a good thing. Though the entire video was filmed as a Korean quizshow, its slapstick humor was charming if hokey and easy to understand at times. Lots of possible test answers were hidden within and made the video seem important to me. The viewing was seemingly held just for me, as the rest of the audience immediately went to sleep or continued whatever games or conversations taking place on their phones. After the hour was up, I felt ready for the written test, even if my nerves weren’t entirely settled. I had a plan at least. Next was the routine “physical” test which only included a quick eye check. Thank you, glasses. The English-speaking employee stamped my paper to indicate completion of each checkpoint and this time, she told me to go upstairs and take the written test. It would take 40 minutes and as always, she wished me luck. Nerves started to come back. So I took the test like a nice driver. Couple that with some common sense and I passed! The coffee had worn off and forced some second-guessing on my part regarding answers but it was over. Onto the next step. This day was moving faster than expected and I was ready to go. It was just before lunchtime and I knew that the country grinds to a halt at 12. My hopes for a speedy conclusion were dashed when I was told that the next challenge wouldn’t come until 1:30. I killed time with some mediocre spicy pork in the basement and knew that two steps remained. First, a test-course driving test and the final step would be an on-road driving test. They seemed to be the most difficult so of course, I poured some more coffee. The queue time gave me a chance to watch the instructional videos repeat-playing before the test. I had a feeling that this test might not have any English instruction so the videos were a much-needed help. Everything seemed so strict and formal. The tension was building. My name was called, I walked down to the course, and got into one of the “test” cars. The nerves quickly faded as I completed the test objectives with relative ease. A dash-mounted screen ordered me to operate the windshield wipers, turn signal, and shift the automatic car from “park” to “drive.” I passed the course test and moved on the final phase. That would be the road test but first, more waiting. More time to think about the final stage and also, more caffeine. A slight yawn at about 3:00 spurred that on and as I didn’t want to drink another drop of coffee, Pepsi would do. I slugged that down before being called upon by the tester. Having to wait for this test gave me yet more time to prepare by watching videos playing beforehand. After another 30 minutes, it was time to start. I checked all points of the car, entered properly, and drove the 5km course like a textbook. Finally, I parallel parked like a glove and was informed that… I passed! I’d be getting my license that day! Success! After all the waiting and challenges, it was over. I graciously thanked the employee who’d helped me throughout the day and started my way back home. It was over and my mind could finally rest. No more constant states of awareness. Just relax and get back home. Two bus terminals later and Yeosu could never have seemed so nice to see. Looking back, I might have some dramatic thoughts about getting a Korean license but the whole process was stressful. Add a language barrier and any official matters can make one’s head bulge with stress. Perhaps that’s all driving offices. As you can see from my story, this was a caffeine-fueled adventure that gave me the freedom I’d been seeking for a while. 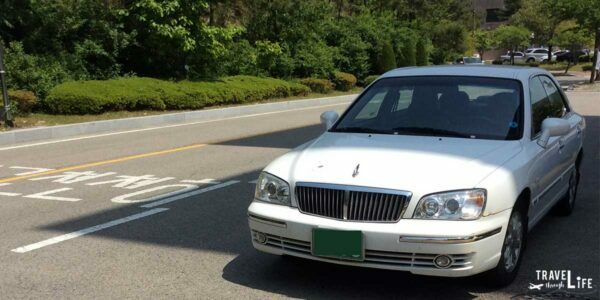 Compared to the US, getting a license in Korea is much simpler and very fast. What do you think? If you’ve gone for your license, I’d love to hear about your experiences. After I passed the driving test in Korea, how long do I have to stay to obtain the international license? I mean, I am staying in Korea for study but I will be back to my country soon. Do I have to stay longer to make the license valid? Thanks for reaching out. From my understanding (as an American), an international driver’s license is different from a Korean one. An IDL is applicable to use for one year and in multiple countries. The Korean license is for use only in South Korea. To get a Korean DL, you need an Alien Registration Card, which you get anywhere from a week to a month after moving to Korea. Hope that helps. Hi Josh, how’s it going? Thanks for stopping by and for the nice comments. Things are going well here and I hope the same is true for you, too. Until we meet again, take care and all the best on getting a Korean Driver’s License. I agree. Sometimes it takes some trials to get something we want. Attaining goals wouldn’t be fun without some work. Thank you. Good for you Carl. Proof that patience and persistence wins the day, even at a DMV. 감사합니다. I appreciate your words. Thanks for commenting! Man, the DMV combined with a language barrier sounds like a true nightmare. Glad to hear it ended up being an okay experience for you. Congrats on passing! Thanks Matt. It was a stressful/enjoyable day that I’ll probably never forget. This story made me recall the day I was to do my road test. I had to steal my Grandfather’s car in order to do it! My mom actually took it (yes, with his permission) and then, on the sly, let me drive it to the DMV for my road test. Thankfully I passed and didn’t crash Grandpa’s grey Honda Civic. Parallel parking was a snap, too, due the small stature of the vehicle. Thank God Gramps never found out, either. I’d’ve been dead! Lol, great that the day ended with you getting your license. Or else, all that risk of not telling him would’ve made you feel empty huh? Sounds like a great experience. Driving tests are always nerve racking. Congratulations on passing your test. Thank you Mina! I feel like I’ve climbed a difficult mountain for sure. LOL, interestingly you’re not the first person to make that mistake. Thanks for commenting. You had a few fun hours at the DMV lol. Glad you passed the test and were able to get your license. Thank you. It was crazy for sure! Thanks for stopping by. Wow what a story. I am so glad that in NJ you don’t have to take a driving or written test anymore. All you have to is show up get, your picture taken and pay the amount requested. When I was reading y our article all I could think about is a commercial here that Geico does with the DMV. Next…. Lol, it definitely is a series of hoops here but I feel that people in parts of the states have to wait longer to get their license. Crazy that New Jersey has made it so easy. Do you think that it makes for worse drivers though? Thinking of former DMV visits puts me in a “special” kind of mood. It’s great you got your license and have that behind you know. I had to re-take the test simply for moving between NC and ID, but years ago when my husband moved from OH to ID, all he had to do was exchange. I guess that got rid of that. Wow, sounds unfair! Do you secretly wish that he had to go through the same hoops as you? Best of luck to you as you try to do that in Ireland! Thanks for stopping by. Wow, what a long day! Good thing you anticipated it. My cousin from England had to take a driver’s test in the US. Let’s just say it took her a few tries. And there might have been some wet pants from instructors as they found themselves on the wrong side of the road. Ouch, that one must’ve been an experience to remember. Lol, I had to drive on the left in Thailand and that was very strange. Couldn’t imagine taking a driver’s test with all the added pressure of having the tester in the seat next to me. Yikes! Lol, it was interesting and it seems that the process has changed. Some people I know have been forced to endure a 3 day training class in the past. Thankfully, I was able to do everything in one day. So I guess to be fair, my day might not’ve been that bad. Thank you so much. I hope your brother doesn’t get angry as often as I do. It can be frustrating when other drivers do things other than the right and proper way. Thank you William. I appreciate that. Your posts on Medieval weaponry are well thought of as well. Yes. Your post made me look at my license and it will expire soon. I also have to make a trip to the DMV and that is not a pleasant experience even without the language barrier. Hopefully I can do this online. That would be so nice. Btw, congratulations. Thanks Tim. I hope your experience is pleasant and you get the job done quickly and painlessly! So fortunate they accommodate English speakers at the DMV. I can’t imagine trying to learn a language like Korean, at least not the written language. What you did takes guts. Congratulations. I never tried to get a drivers license while residing in Chile. They have fabulous public transit and the city is very crowded so I wouldn’t want to drive. The gasoline is also very expensive. How are the gas prices in SoKo? Korean writing/reading is fairly easy. It’s the speaking that’s got me sprouting gray hairs but thankfully, they do accommodate us as well. Gas is steep here when compared to the U.S. and is running at about $1.75/liter. Rough estimations make that about $7/gallon. Thankfully I’ve got a car with good gas mileage and a scooter to get me around while in town. Yeah, my Korean can only go so far. Had dinner with someone recently who spoke very quickly and was very hard for me to understand. Grammar/verb tenses can be tough to figure out. Congratulations on passing and giving the nice answers – that is so neat. I live in Ontario and I know I went 100km out of my way to find a good DMV office where I passed first time around. The ones closer were all said to be arrogant and I would probably fail the first try. So even in small communities, they aren’t always helpful. Glad your experience was better. Wow, sounds like you had a tough time there. I hope you have good experiences in the future! Lol, sorry about that. It stands for Department of Motor Vehicles in the U.S. Hard for me to have titled it any other way while keeping it concise. Will add a disclaimer now. Thanks for letting me in on that. Congratulations on passing your test! Sounds like a really interesting process. It’s great that you were able to do it in English, even in a smaller area. Good luck on your hunt for a car. Sounds like a long day! Congratulations on passing after all of that! I luckily haven’t had too many terrible experiences at the DMV here in the United States. My husband on the other hand didn’t have a good experience the last time he was there. He was taking the on-road test to get a license and went onto the curb a bit when backing around a corner. The test person told him that he was a “menace to society”! How rude! Wow, it must be a tough experience. I always found those people to be so rude. They have all the power, huh? Hopefully he got his license eventually. Getting a license is always a tough job. But a helping attitude from the officials helps a lot. Hi Carl, very interesting look at the Korean DMV and glad you gave the NICE answers ! I recently traded my Ontario, Canada licence for a Nova Scotia, Canada license as I reside in each half the year but my birthday, when licenses are renewed here is usually spent in Nova Scotia. I was taken by the informality. Instead of the eye exam I would take in Ontario the examiner simply asked if my eyesight was OK and accepted my answer that it is. She then gave me a license that would basically permit me to drive anything short of an oil tanker. Nice Folk. They would enjoy Korea ! Wow. I have a friend who also lives in Canada and he left his license here. Said he just had to wait about 15 min. to get a new one. I’m thinking he’s in Ontario but in a smallish town with perhaps the same level of informality as you. Really interesting how different these places can be. Thanks for sharing. So the DMV is all about waiting, wherever you are. Yeah, unfortunately! It was quite a hectic and confusing day. Congratulations. I am always surprised at how many Koreans fail the test. I thought it was by far easier than what I went threw in 1986 back in the US. But perhaps, that’s just experience behind the wheel. So what car are you going to grab now? Right now, I’m looking for something on sarangbang and will probably get a small sedan. Not too expensive though. Do you drive? Only when in Jeju. The cost of fuel is usually not worth it for us.